These brownies are close to my heart for two reasons. 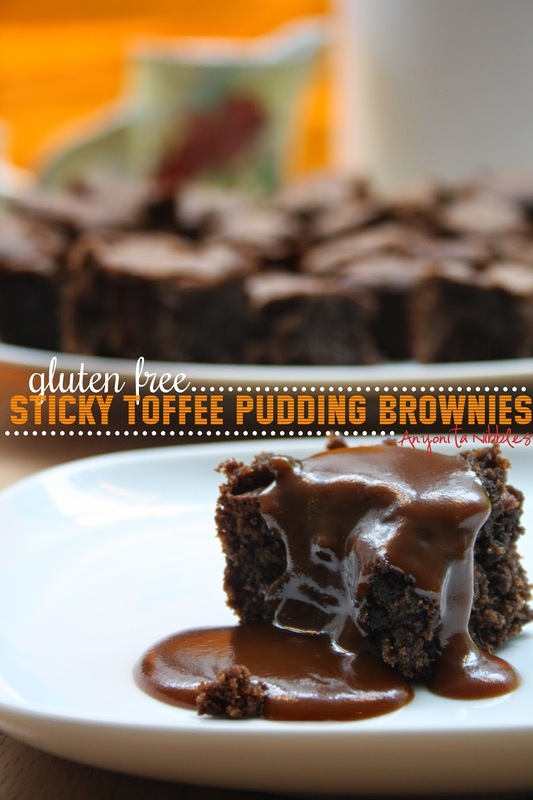 When I wrote this recipe, I was still in mourning over the lack of gluten in my life. This weekend, I was in Paris for +Gourmandize UK & Ireland 's #ParisFoodTrip--you remember, that competition that I won? One of the things participants were asked to do was to design a recipe of classic food to their native countries. On Saturday, we all cooked the dishes we'd designed and had a big pot luck lunch. It was lovely and a great way to taste cuisine from across Europe. Since I consider myself to have two native countries (US by citizenry and UK by choice), I wanted to make a dish that combined both of these. Everybody loves a good, gooey American brownie. In the UK, everybody loves a good, gooey sticky toffee pudding. It's one of those classic pud desserts that just screams comfort food. Before Coeliac, I couldn't walk out of a restaurant without sampling their sticky toffee pudding. It is by far my favorite UK dessert. Combining the two just seemed like a no-brainer. What I love most about these brownies is how indulgent and decadent they are. There's no toffee sauce in the actual brownie but it still tastes like there is. That's down to the muscavado sugar used when making the cake. Muscavado sugar (also known as molasses sugar) is a brown sugar with a very strong molasses flavor. As it cooks, it tends to mellow and deepen leaving you with a delicious toffee taste where there's no toffee present. It's genius. Every good sticky toffee pudding is inverted and doused in lashings of toffee sauce. That's an important part of the dish and it's an important part of this recipe. 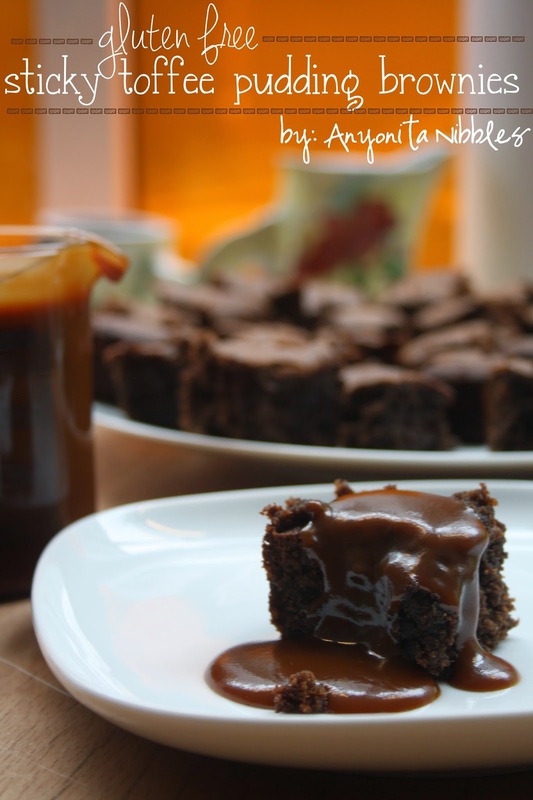 Once the brownies have cooled slightly but are still warm, pour over the toffee sauce and go grab a spoon! Chop the dates into a fine dice using a knife or a food processor. Sift both flours into a bowl with the cocoa powder, salt and xanthan gum. Add the dates. Cream together the butter and sugar with the paddle attachment of a stand mixer until smooth. Add the eggs, one at a time and mix to fully incorporate. Add the wet ingredients to the dry and fold in so that there are no streaks of flour. Bake in the oven for about 30 minutes or until a skewer inserted, comes out clean. Make the toffee sauce while the brownies bake. Place the sugar into a sauce pan with a splash of water. Heat until a caramel forms. Do not stir the sugar, just let it form a caramel on its own. Remove the caramel from the heat once it has a nice, even brown color. Add a bit of the cream. Be careful as the cream and the caramel will bubble up. Whisk to combine and add a bit more cream. Place the caramel back over a low heat and whisk to incorporate. Add as little or as much of the cream as you'd like depending on the consistency you want. Add more cream to make the sauce more pourable. Set aside once you have reached the desired consistency and allow to cool. 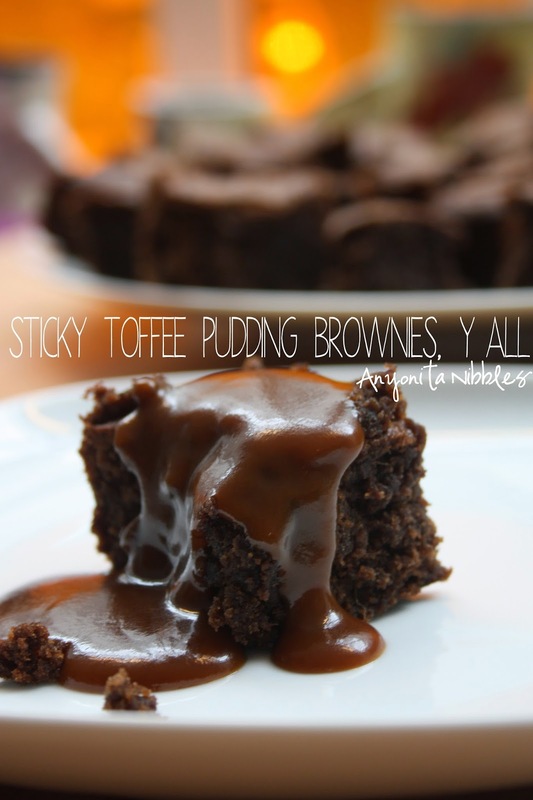 Serve the toffee sauce poured over each brownie. Anyonita! These look so rich and gooey! I just want to lick my screen right now! Wonderful dessert!! that is just gorgeous!!! pinned it! These sound so good. 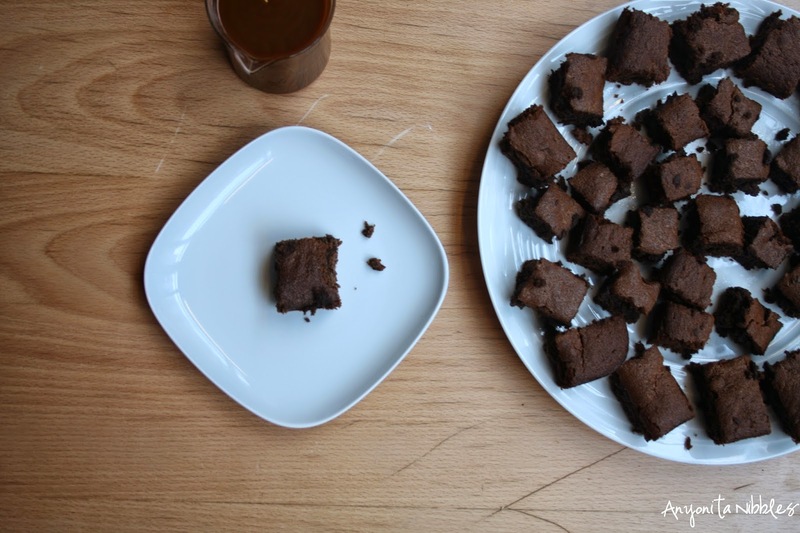 Wonderful that you can have the good old USA-style brownies that you love! I love toffee so much! These look INSANELY fabulous!!! WOW!!! Thanks for the recipe, I loved it. I must try it at home. Do you know if I can replace the xanthan gum by something else ? Thanks a lot and I was very happy to meet you last week-end. These photos are almost perverse, they look that good! Thanks for another wonderful GF recipe!! They look AMAZING! Your gluten-free journey is proving to be very tasty! These look truly divine! We used to eat gluten free back when my youngest was very little and had a wheat allergy (we weren't sure if it was celiac) that caused terrible reactions. Although amazingly enough, he outgrew it, we still use some of the gluten free products we used to use because we found we liked them better. I'd like to try more gluten free recipes though. Starting with this one! I'll take 20 of these! :) YUM! Oh I can't wait to make these. They look so scrumptious! I will have to take a look in the store for Muscavado sugar as it sounds like it would be interesting to experiment with in various recipes. Thanks for the recipe and tip and for sharing on Share Your Stuff Tuesdays. This looks sinfully delicious! I am soo considering being bad tomorrow and making these...hahaha Thank you for sharing this! Oh god, I feel like I have to make these right now. Oh how they look good. Hmmm, your puddings looks so delicious. I must give it a try. Thanks for sharing with 4 seasons blog hop. Cheers and have a nice day. What an amazing recipe and they sound decadent! So glad you stopped by and shared on the Four Seasons party. We loved them so much they are being featured on this week's party! Congrats.